We visited the Florida Keys two years ago and although the drive across the overseas highway is truly beautiful this time around we where looking for a more convenient and quicker way to get there and boy did we find it! 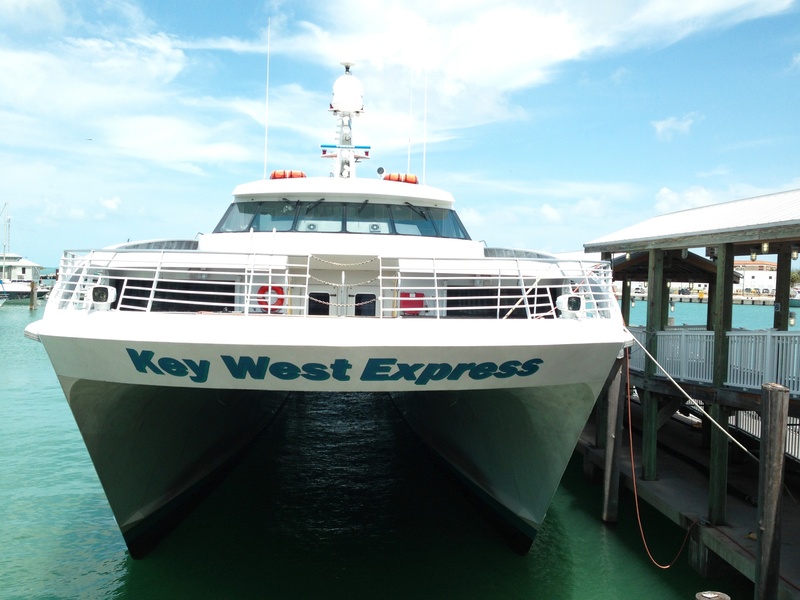 We boarded the Key West express from Fort Myers Beach and in less than four hours we where docking in Key West. Getting ready to leave for Key west aboard the Key West Express. Enjoying the views of the fishing boats docked on the marina. The Key West Express Ferry sails from Ft. Myers Beach year round and from Marco Island seasonally and it is without a doubt the fastest, most convenient and most fun way to get to Key West! 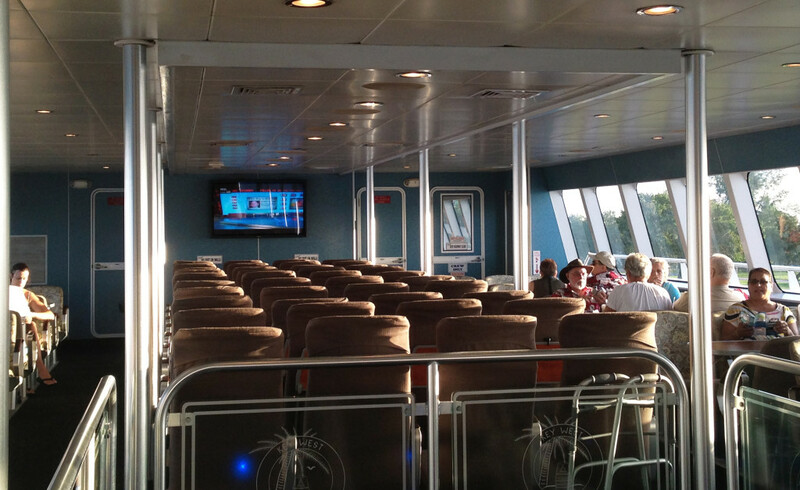 The modern, air-conditioned high-speed ferries feature sundecks, snack bar, cocktails and big-screen TVs. You can choose to sit indoors or outdoors and enjoy beautiful ocean views all the way to your destination. 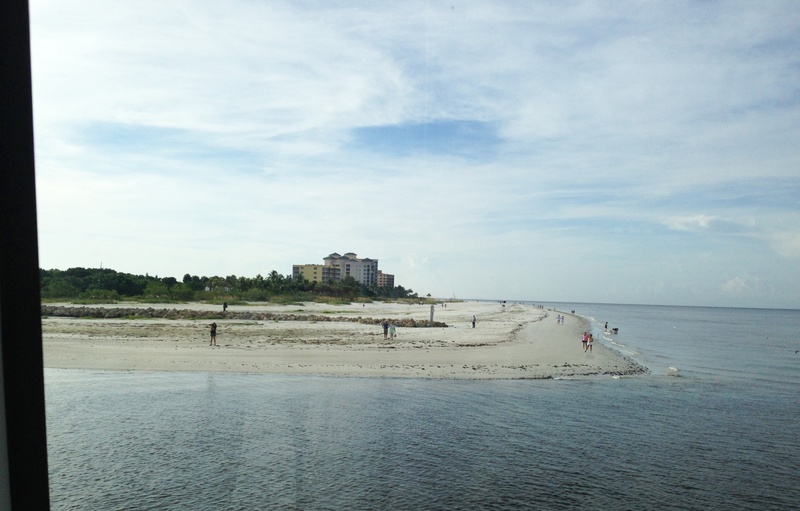 View of Fort Myers beach from the water. The trip was quick and convenient. You don’t have to worry about driving, accidents on the road, getting speeding tickets, inching along on 35 mile an hour zones or being on the lookout for Key deer and Key West chicken jumping in front of you on the road. The Key West Express conveniently leaves from Fort Myers beach year around and there are also trips from Marco Island during season. The staff was very helpful and answered questions and made recommendations about where to go and what to see in Key West. Everyone from the people who welcomed us onto the boat to the bartender was extremely friendly. Traveling in comfort on the Key West Express ferry to Key West. You can sit at the tables and play some cards, have a snack or watch a movie. 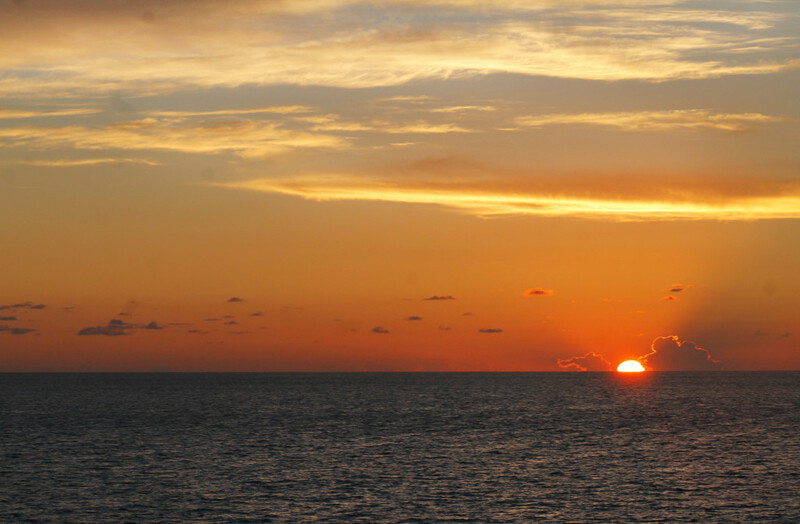 On your way back you will get to enjoy watching the sun setting on the turquoise waters of the Gulf of Mexico. You get to enjoy beautiful view of the ocean and if you are lucky maybe you’ll even get to see dolphins. You can relax and watch a movie during the trip. Take into account the trip is about 3 and half hours each way, some people stay in Key West just for the day but we think a few hours is not enough to enjoy everything the Conch Republic has to offer so consider staying overnight. If the seas are rough there is always the danger of motion sickness. I usually get seasick pretty easily but the ferry was so fast that event though the sea was not completely calm there was not much bobbing around. The snack bar has lots of Dramamine available so take one as soon as you get on the boat just as a preventive measure. During summer the service is not available every day so make sure to check the Key West Express schedule and calendar and plan your trip accordingly. Outdoor parking in Fort Myers Beach is $8 per day, not bad really but if you are staying for a week like us take a cab or get someone to drop you off. The Key West Express ship docked in Key West. 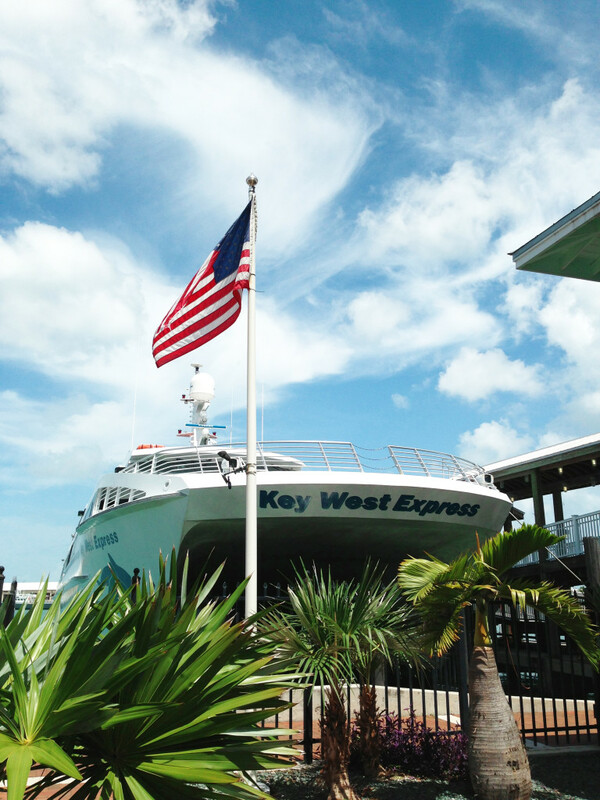 Taking the Key West Express instead of driving was the perfect way to start and end our romantic Key West getaway. We arrived at Key West relaxed and in great spirits, ready to enjoy all the sights instead of being tired and stressed after a 6 hour drive. After almost a week in Key West it was great to just get on the boat and be sail off into the sunset. After watching the sun sink into the Gulf waters (talk about romantic) my husband and I enjoyed watching a movie together and arrived back home around 9:30pm. Sunset over the water aboard the Key West Express. Visit the Key West Express website for more information, like their Facebook page and follow them on twitter to stay up to date with their latest news and specials. 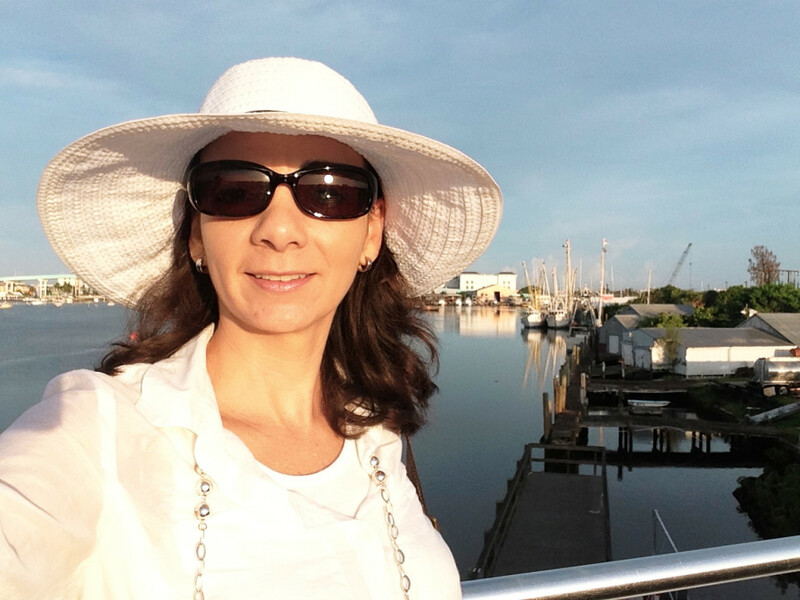 Taking a ferry is definitely the way to go-I never quite made it down to Key West or any of the Keys for that matter–I think it is a place I would simply love. 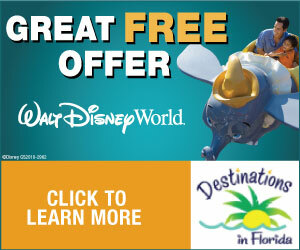 I am planning a trip to Key West in the next year, this is such great information, thank you for sharing! Thanks for the info. 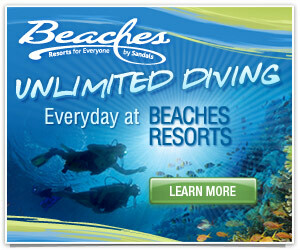 I did not know there is another way of going to Key West than diving. Such a relaxing and fun getaway for you guys. 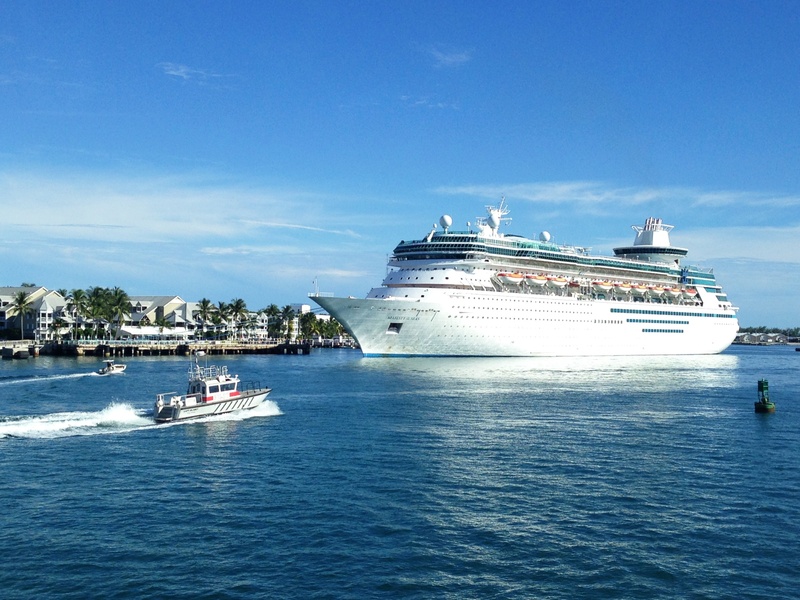 We’re so glad that you had a great time on the boat and that your time in Key West was enjoyable. As you did, we do recommend that if time permits that folks spend at least a day to see the sites, but it can be done in a single day as well. PS, just one thing. Parking in Ft Myers Beach is only $8.00. Thanks so much Scott, it was really an unforgettable trip. Made the necessary correction regarding the parking, thanks! It would be hard for me NOT to drive to Key West because I love it so. The drive never stresses me out, it is usually the most relaxing part of my trip. I definitely see merits to the KW Express. I might try it one day.